LANCASTER – The University of Antelope Valley Pioneers (16-4; 6-1 Cal Pac) remain tied atop the conference standings after defeating the No. 22-ranked Bobcats of UC Merced (17-5; 5-2 Cal Pac) Saturday evening, 95-81 in intercollegiate California Pacific Conference women’s basketball action inside the Pioneer Event Center in Lancaster. With the victory, UAV breaks a three-way tie atop the Cal Pac, sending UC Merced into the second position while remaining tied at 6-1 in first place with Embry-Riddle, a team that handed the Pioneers their lone conference loss of the season a little more than a week ago on Jan. 10 in overtime, 101-96. Looking ahead, UAV has seven Cal Pac games remaining with just three of those contests coming against teams with a .500 record or above. 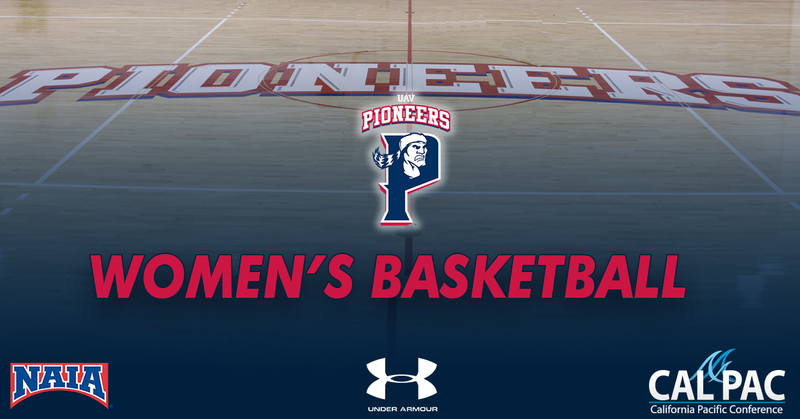 The Pioneers face off with Embry-Riddle again in a revenge game at the Pioneer Event Center in UAV’s regular-season home finale on Saturday, Feb. 9. Senior guard Samantha Earl (Clovis, CA) led all scorers in the contest with 28 points and also added three rebounds and three assists, junior forward Tylen Price (Lancaster, CA) added 18 points, three rebounds, two assists and one steal, and sophomore forward Alexia Budd (Los Angeles, CA) finished with 11 points, a team-high eight boards, two assists and a block and a steal. Senior guard Ilianna Blanc (Los Angeles, CA) and senior guard LaChae McColor (Honolulu, HI) each contributed eight points and senior guard Alyssa Gonzales (Bakersfield, CA) chipped in with seven points, seven rebounds, a team-high five assists and one steal. UAV hit 34-of-75 field goals (.453), 9-of-26 three-pointers (.346), 18-of-31 free throws (.581), and outrebounded the Bobcats, 50-43. The Pioneers committed 14 turnovers and stole the ball seven times. UC Merced made 26-of-65 shots (.400), 12-of-31 three-pointers (.387) and 17-of-29 free throws (.586) and committed 17 turnovers and stole the ball from UAV six times. NEXT GAME: Coached by Deon Price, the Pioneers remain at home to host La Sierra University for a California Pacific Conference contest on Saturday, Jan. 26 at 6:30 p.m. PST inside the Pioneer Event Center in Lancaster.